The fruitful career of Anton Mauve, a melancholy and many-faceted artist, came to an abrupt end in 1888. His death took place during the heyday of the Hague School, of which he was one of the most important representatives, and it was a harsh blow for pictorial art in the Netherlands. At the artist´s workshop in Laren numerous paintings, watercolours and pastel and charcoal sketches were found, on the themes of Dutch dune and heath landscapes, groups of people working, as well as depictions of cattle and cattle heads. A large number of the works he left behind were marked with his studio's stamp, as we can see in this picture, which presents a very special atmosphere, entitled Crossing the Heath. The drawings that form part of Mauve's legacy make up a good part of his workshop's stock, and served, in many cases, as starting-points for his pictorial work. Mauve transferred the sketch onto the canvas with liquid paint and then progressively adapted the tone, colour and composition until he was satisfied with the result. Mauve, a melancholy artist who was prone to depression, found it difficult to finish a work; he tended to continue making changes in search of the definitive image. Thus, the oils and watercolours he left behind were undoubtedly at different stages of completion. During the latter years of Mauve's productive life, international demand for his work was so intense that his canvases were sold before they had even passed through the sketching stage. Art-dealers took unfinished works from the workshop in order to satisfy the buyers. When a client asked for it, Mauve was usually prepared to introduce some subsequent change to the work, but then the risk existed that the artist might be so rigorous as to change the original canvas radically. According to one story, the artist was once asked to outline the branches of a tree a little more, but when the final version was produced the tree had disappeared entirely. One of the most important collectors of the Hague School was the English railway magnate, James Staats Forbes (1823-1904), who, for reasons of work, spent eighteen years in the Netherlands. That is how he discovered various Dutch artists of this School and their works. In addition to dozens of works by Jozef Israëls (1824-1911), his collection featured numerous oil-paintings and watercolours by Anton Mauve. He preferred the later works and the way in which the painter observed nature and the human presence was reduced to a few chromatic accents. In the commemorative exhibitions that were organised in the years 1890 and 1895, Forbes participated with no less than fifteen works. 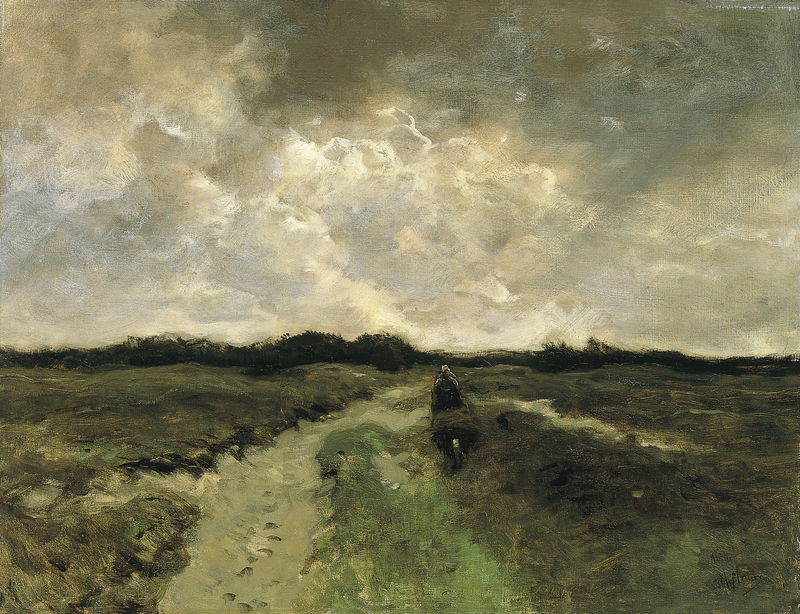 The idea for Crossing the Heath undoubtedly emerged in the picturesque village of Laren, in the region of Gooi, where the artist found his inspiration during the latter years of his life. In his works we can see the surrounding heath-lands, with their innumerable herds of sheep, but also the humble inhabitants -such as the countrywoman who is pushing her cart loaded with logs. Crossing the Heath presents the same desolate atmosphere as the picture The Marsh, in the Rijksmuseum Collection in Amsterdam, although it is at a somewhat lesser stage of completion. The loose touches at the bottom left-hand corner, and the fact that the canvas shows through the paint, indicate that the artist has not yet finished the work. The monumental cloudy sky that threatens rain endows the work with its unmistakable and extremely poetic ethereal depiction of the atmosphere so typical in Mauve's work.